Individual servings of sautéed celery in a creamy wine and brie sauce topped with bread crumbs, walnuts and crispy prosciutto. In a large skillet, heat 3 tablespoons of butter. Add celery, onion, garlic, salt and pepper and sauté until soft. Deglaze pan with wine and cook for 2 minutes. Add alfredo sauce and stir to combine. Heat for 3 minutes and add brie. Spoon into individual ramekins. In a medium bowl, melt remaining butter in the microwave for 1 minute. Add bread crumbs and walnuts. 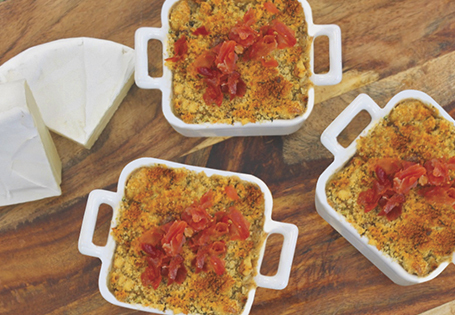 Top ramekins with bread crumbs and bake for 10 minutes until golden brown and bubbly. Meanwhile, heat a small skillet over medium-high heat. Brown prosciutto. Drain on a paper towel, then place atop gratin.